The Heart and Mind Festival Annex is honored to present The Power of the Sacred Human, a special event to celebrate the Spring Equinox, in partnership with the Rubin Museum or Art. This event is dedicated to the concept of the Sacred Human as presented through different global traditions. Elders, teachers, indigenous wisdom keepers, artists, philosophers, and freethinkers from the Taino, Quechua, Rosebud Sioux Tribe of the Sicangu Nation, and Tibetan traditions will take part, including Maestro Domingo Dias Porta, Maria Guadalupe Abundis De Dias (Lupita), Maestro Manual Ruffino, Tata Pedro Cruz, Tito La Rosa, Melaine Stoneman and MaryAnn Bearheels, and Ven. Khenpo Tsewang Dongyal Rinpoche. Through an interactive experience that will include sacred rituals, concerts, meditations, lectures, and panel discussions, attendees will learn about the presenters’ visions, wisdom, and ways of life. Join us in celebrating the Power of the Sacred Human. Co-presented with Golden Drum, The Sacred Arts Research Foundation, Movement of the American Indian Solar Culture (MAISC), Acción por la Unidad Mundial, and the Universal Initiatic College. MAESTRO DOMINGO DIAS PORTA was born in Caracas, Venezuela in 1930. Under his guidance, the Initiatic Sovereign Solar Order of Chichaan Itzaab (S.O.S.X.I.) has developed in different places in Venezuela, Mexico, the United States, Europe and Peru. He has founded and organized cultural and spiritual activities in almost all countries in the Americas, in 10 European countries, in Israel and in Morocco. He is the founder of the Association of the Solar American Indian (M.A.I.S.) Movement of Cultural Approach to the Autonomous Traditions and Peoples of the Continent. He is also the founder of “Acción por la Unidad Mundial” (A.U.M. - Action for Global Unity), a movement of International Cultural Integration to promote a culture of peace through dialogue of personal transformation, through exchange of knowledge, and joint participation in activities and programs (both on the individual and group level). MARIA GUADALUPE ABUNDIS DE DIAS (LUPITA) has dedicated her life to the Sacred Initiatic Tradition for her own spiritual and human evolution and for the benefit of those who surround her. She graduated with a Masters Degree in primary education in 1982 and she entered the Initiatic path and became a student in the lineage of Dr. Serge Raynaud De La Ferriere In 1998. She currently works with many women's groups and has helped organize many women's gatherings at both the national and international levels, having lived in the United States, Mexico, and Venezuela. Lupita is a member of “Insignias Aztecas”, a non-profit organization promoting and preserving the tradition and teachings of the Aztec dance. She has participated at the Shoshone-Kumiai Ghost Dance in Escondido, California and has participated in the “Magos de La Tierra” seminar with Jose Arguelles in Chile and Portland, Oregon. Lupita is currently a member of S.O.S.C.H.I. (Sovereign Solar Order of Chichen Itza), an organization promoting peace and the spiritual development of individuals for the benefit of all humanity and L.H.A.S.S.A. (the Academy of Ancestral Wisdom). She is the director of the Superior Course in Theurgy, an on-line course taught by Maestro Domingo Días Porta and is an essential member of the organizations M.A.I.S. (Commonwealth of the Solar American Indian) and Accion por la Unidad Mundial (A.U.M.) / Action for Global Unity as a personal support to Maestro Domingo Dias Porta. Additionally, she is currently studying to receive a license in Gurukul Ayurveda under the direction of Dr. Ramon Gonzalez at UPTM University in Mérida, Venezuela. Lupita is happily married to Maestro Domingo Dias Porta, is the mother of 4 children, and grandmother of 2. MAESTRO MANUEL RUFINO is a recognized elder in the Taino tradition and World Director of M.A.I.S.C. (The Movement of American Indian Solar Culture). He is a spiritual guide, gifted ceremonial leader, and teacher of sacred initiatic traditions of the world. Maestro Manuel is also an artist, certified iridologist, naturo-therapist, vegetarian chef, and the visionary guiding the Golden Drum community and many vegetarian restaurants including Jungle Café in Brooklyn. Guided by his teacher, Maestro Domingo Dias Porta, Maestro Manuel has been following the trails of indigenous healing arts for over 40 years. Maestro Manuel travels around the world sharing initiatic traditions, leading workshops, lectures, sweat lodges, and healing rituals. In 2010 Maestro Manuel and a number of his students opened Golden Drum as a space for sacred traditions in New York City. Founded to give voice to the worldview of Native Americans, indigenous peoples, and the esoteric schools, Golden Drum features living representatives and students of these great traditions. TATA PEDRO CRUZ is one of the few surviving members of the Mayan Council of the Elders of Tz’utujil, which is a branch of the Maya Qui-che. “Tata Pedro,” as he is most affectionately known, is a traditional Mayan Ajq’ij and Day Keeper, and one of the principal authorities of the Council of Mayan Elders of Lake Atitlan in Guatamala. He received the title “Heart of the Lake Atitlan” K’U’XYA by his fellow Mayan Council of Elders and Tz’utujil people. Tata Pedro recognizes the interconnectedness of all people, the expanding consciousness of the planet, and the urgent need to unify our spiritual, cultural, and ethnic wisdom for the benefit of the planet and humanity. 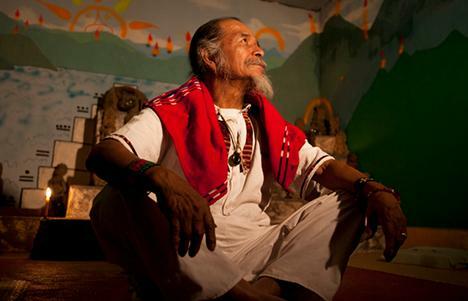 Tata Pedro is a globally recognized elder in the Mayan tradition and has traveled far and wide sharing knowledge, ceremonies, and practices. He is the interpreter of dreams for his community and a leader of the preservation and education of Mayan day keeping and fire ceremonies. TITO LA ROSA is a descendant of Quechua Indians of the Peruvian Andes. For many years, he has been recovering and preserving, studying, and intuiting the ancestral music of Peru. He is also a Curandero de Sonido, a sound healer, who enters into an altered state to bring forth sound that elevates, allowing for healing and balance to occur. Ancient Andean wisdom teaches us that the earth was made while the creator sang, thus all beings are made of sound, rhythm, and harmony. Through his concerts, flower ceremonies, and music classes La Rosa helps reawaken our memories (memoria antigua), weaving sounds into frequencies that open the heart and encourage the spirit to soar. La Rosa has recorded with Mary Youngblood on the Silver Wave record label. His 2002 CD, “The Prophecy of the Eagle and the Condor,” was nominated for a Native American Music Award, for Best World Music Recording. MELANIE STONEMAN (Wakinyan Ska Wi—White Lightning Women) and MARYANN BEARHEELS (Ta Oyate Waste Wi—Her Good Nation Women) are Sicangu Lakotas from Rosebud, South Dakota. They will share a discussion on Native American Community Genetics: Learning Our Oral Traditions, Creation Stories, Spiritual Food & Bear Dance. VEN. KHENPO TSEWANG DONGYAL RINPOCHE was born in eastern Tibet and enthroned as a Nyingmapa abbot by His Holiness Dudjom Rinpoche. He traveled and studied with H.H. Dudjom Rinpoche, as well as with his late brother, Vajrayana master and scholar Ven. Khenchen Palden Sherab Rinpoche, and his father, the hidden yogi Lama Chimed Namgyal. Ven. Khenchen Palden Sherab Rinpoche and Ven. Khenpo Tsewang Dongyal Rinpoche established the Padmasambhava Buddhist Center (PBC) in 1989 to preserve the authentic message of Buddha Shakyamuni and Guru Padmasambhava in its entirety, and in particular to teach the traditions of the Nyingma school and Vajrayana Buddhism. PBC includes over 20 centers in the USA, India, Puerto Rico, and Russia, as well as monastic institutions in India, the USA, and Russia. As a holder of the complete Nyingmapa lineage, Khenpo Tsewang Rinpoche is fully versed in the Theravada, Mahayana, and Vajrayana schools, and is a master of Dzogchen. He has co-authored over 30 Dharma books in English with Khenchen Palden Sherab Rinpoche, and travels throughout the world giving teachings, empowerments, and personal guidance in fluent English at numerous retreats.